I was initially excited about this book with the expectation that I would discover new insights on battling temptation. The first half of the book as basically priming the pump. Hunter spends all this time revealing all the ways we struggle with sin and the crucial need to find a way out of temptation. 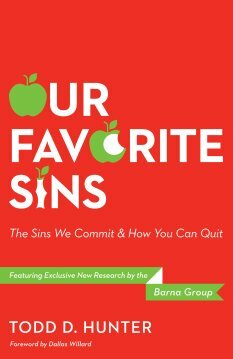 Most interesting is the chapter analyzing recent research on how people deal with temptation. The second half of the book is his answer to battling temptation: through the age old methods of the church. These methods are solitude and silence, use of ancient church prayers, taking part and understanding the sacraments of baptism and the Eucharist, and finally use of the lectionary – in other words, the Scripture readings of the church. Being a Lutheran myself, I understand these ideas and to some extent do see many of these methods as useful and a crucial part of battling sin. But some solutions to me seem so hollow – especially the strong emphasis on using ancient church prayers. These certainly are precious and as he calls them “sacred language” but let’s get real with God and bare our hearts. I don’t need a written down prayer from ancient times – I need the prayer of my heart here and now. I do like the emphasis on the Scripture and letting the word of God influence and shape your thinking. And fasting as a way of disciplining our body is key as well – he barely touched on that toward the end and believe that more time could have been spent on that lost practice of fighting temptation. This book is well written with many great stories and examples. It’s very accessible. Unfortunately, I was disappointed after patiently reading through 135 pages to discover church liturgy as the answer to temptation. This is a part of BookSneeze®.com book review bloggers program.